Mugunghwa Korean Restaurant at Lotte Hotel Seoul will present an Aromatic Spring Festival from March 1, 2006 through May 31 featuring the fresh spring herbs of Korea. 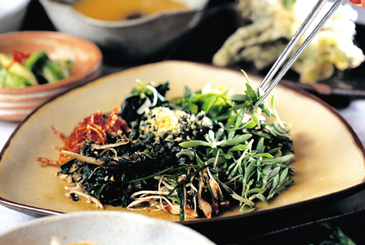 Fresh Spring Greens called "Beom Namul" in Korea, are known to revitalize appetite and help relieve fatigue with their abundance of vitamins and minerals. This spring, Mugunghwa will offer well-loved specialties like spring greens and crab preserved in soy sauce, spring greens and seafood with steamed rice in a hot stone bowl, and cold noodles with mugwort d'hote. Prices range from 37,000won to 40,000won. Service Charge & VAT are not included.